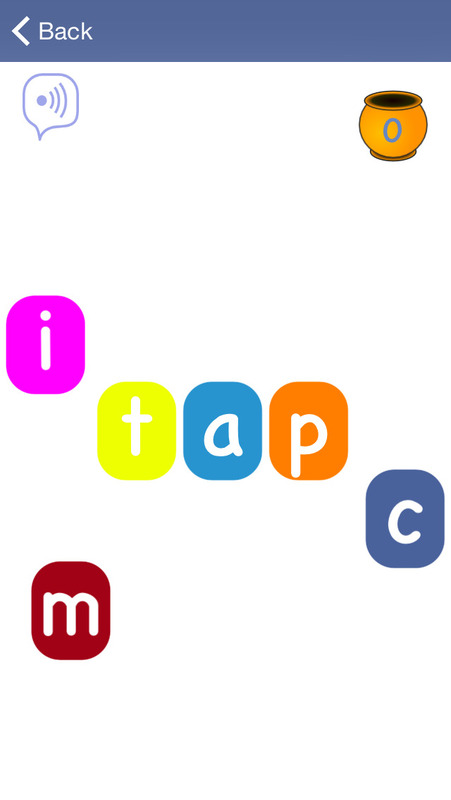 An app to help young children learn to read through phonics. This is an app that uses a couple of different ways and strategies to help young children learn to read through phonics. Using both sounds and letters/words the app works through a number of different ways to help young people become familiar with the sounds that different letters and words make as well as being able to recognise the different letters and words. 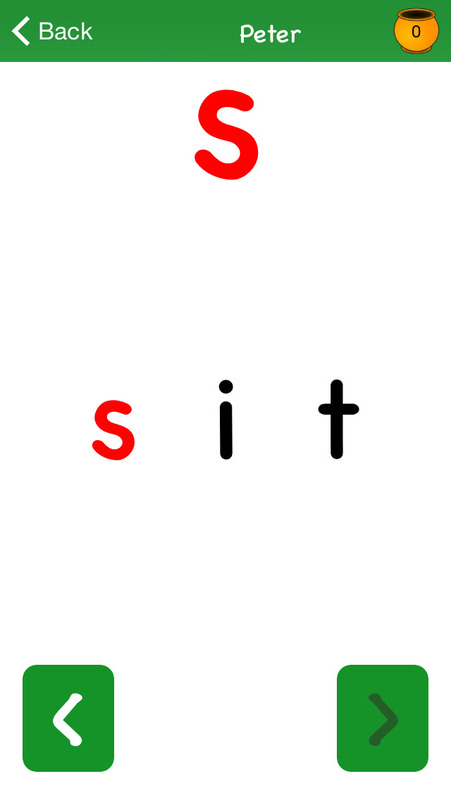 The app is set out using 8 groups of letter sounds and graphemes, growing in complexity as the user works through the lists. These lists for an integral part of the app once the user begins to access the different parts of the app. There are 2 main parts to the gameplay of the app which include a learning element where users can access the different sounds/letters, blends and words and then a game element where they can compound the knowledge gathered from the other side of the side in a fun interactive way. The learning element is split into sounds and words with each allowing the user to select which list they want to work from. On the side of each list there is a small tracking element which tells the user what lists they have already started and what their progress is. This is quick and visual and a good aid to seeing at a glance how well a user is doing in working their way through each of the lists. For the user it would make sense for them to begin with the sounds and then move onto the words aspect, however because it is split it does mean that users of different abilities can access the app at what level they require. The added bonus of this is that you can keep coming back to the app at the point you require of it and different abilities of young people can also access the app appropriately rather than having to tediously work through the app until they get to the bit that is right for them. Once in the game section, the other half to the learning section, the user can choose again from either sound games or word games. 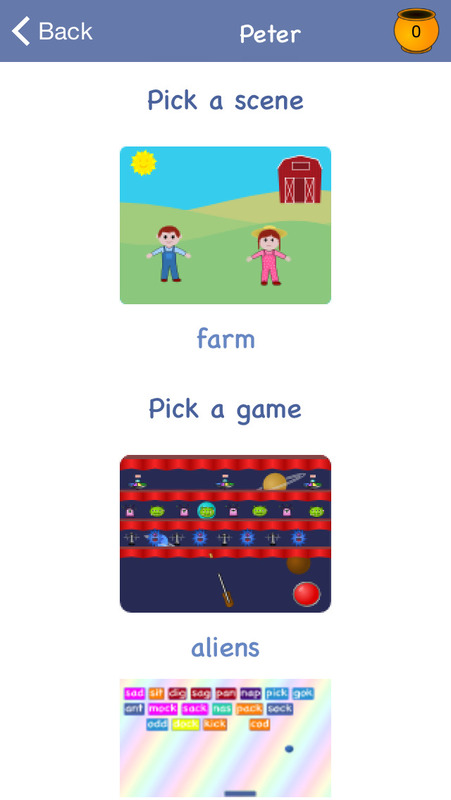 There is also a choice of different games which can be accessed from earning stars in the learning section of the app. The user earns stars for the more they do in the learning stages of the app. The games within this section also expand depending on how many words, sounds etc they have worked through. The more of these that have been completed in the other side of the app the more there is available in the game. This competitive nature will not only keep the user engaged through the app but will encourage them to continue using it other a period of time rather than just the odd ‘one-off’ here and there. The gameplay and usability of the app is very good. The display is quite simple but this is definitely a plus as it means the user can easily access all the functions. From the home screen the user can also access a ‘parent/teacher’ feature. This gives a couple of different options which really add value to the app as a whole. From this menu you can add multiple users, ideal for a classroom setting’ access the lists and the letters that appear in each, change the audio option available from male to female or even the ability to record your own. This is a fantastic feature as it means, again especially in a school setting, the educator can adjust the pronunciation of the sounds correct to the dialect of the area. Another excellent feature within the app is the ability to see the progress a child is making and the ability to export this information. These features not only add value to the app but make it an extremely worthwhile one for an educational setting. Fab Phonics has been designed in conjunction with primary school teachers to help give your children the best possible start when learning how to read. It combines learning sounds and words, concentrating on blending of the sounds together to make the words. The pupils can earn point which enable them to play games. 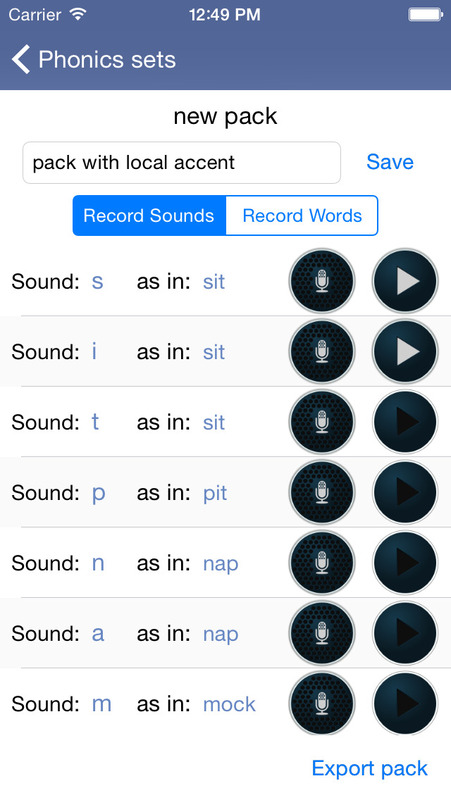 The app comes initially with two phonics packs (one male and one female), but also provides the ability to record your own audio, so if you want to have an accent that is different to those provided you can record your own phonics and words and use these instead. 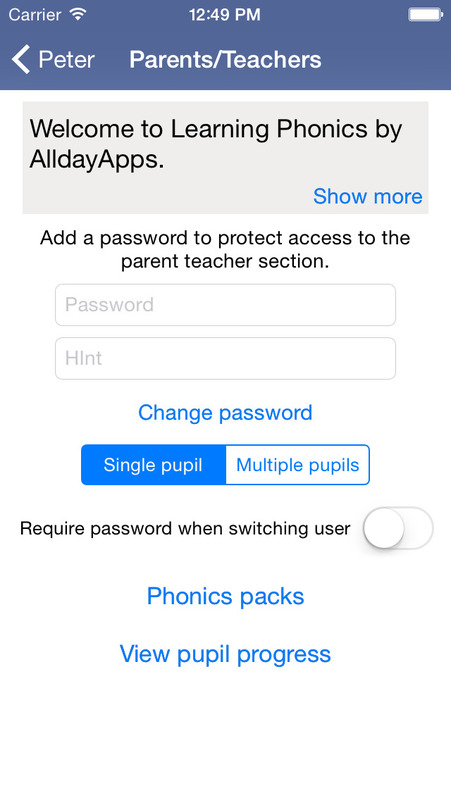 Your phonics packs can also be shared with others via email or file sharing apps such as DropBox to enable schools etc to provide ones that they are happy with for all families to download. Fab Phonics can be used either for a single pupil, or for multiple pupils. It allows you to track the progress of each pupil, to see how far they have moved through the phonics and words. You are also able to export a progress file that can be read into excel that will show the progress of all of the pupils. The app will cover all of the phonics currently required by the UK government year 1 phonics screening tests. The app provides a structured development/practice of skills and knowledge as well as giving, if required, detailed analysis of a child's performance and progress.